The logo consists of a lighted lamp which is on top of a scroll symbolizing eternal learning. It is placed inside a circle, referring to a red sun signifying the giver of life, whose ten rays symbolize the consituted eleven members of SEAMEO. As in the logo is the acronym of the Organization placed underneath the scroll. Together with the lighted lamp and the scrool, it is set on a grey circle with a white outline. The RELC logo depicts a Southeast Asian organization build for the region, premised on a strong foundation to achieve the agenda of SEAMEO. The depiction of a roof above the letters RELC is reflective of Southeast Asian architectural style and symbolizes the flavor of Southeast Asian nations which train at the Centre and the hospitality which the Centre holds out to all. The three strips at the roof represent the collective desires of the people of Southeast Asia to improve lives through education, science and culture. Below the letters RELC, are three solid steps which symbolizes the foundation of the Centre. The Centre is built on the respect for learning, wisdom in responding to learning and fortitude in it understanding. The navy blue of the logo symbolizes the quest of the Centre to stay true to its vision and mission in the region. 2018 marks a significant milestone for SEAMEO Regional Language Centre (RELC) as we are celebrating our Golden Jubilee this year. 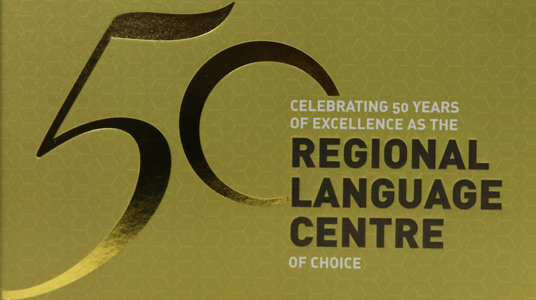 In conjunction with the anniversary celebrations, we have produced the SEAMEO RELC 50th Anniversary Commemorative Book, “Celebrating 50 Years of Excellence as the Regional Language Centre of Choice". The book illustrates the rich history of RELC and the impact of its work on the people in the region and beyond and it can be purchased at $70. Welcome to the first issue of our new bi-annualy SEAMEO RELC newsletter. Continue reading or subscribe.